We know it’s not enough to impress event attendees with a simple banner or overhead sign. That’s why we offer multiple sponsorship opportunities to our clients. We pride ourselves on helping you get your message and brand in front of potential clients, colleagues and anyone else you might need to connect with. Below you’ll find the various sponsorship opportunities available for you, your sponsors or your exhibitors to provide an immersive experience for your attendees. An immersive branding opportunity for you, your sponsors and exhibitors. 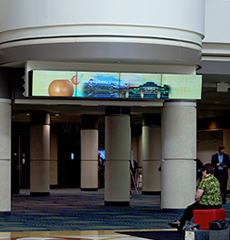 Create attendee interactions with large format displays around the facility. 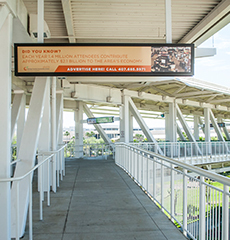 Expand your brand or sponsorships outside the convention center in high traffic walkways between our West and North/South Concourses.